Moroccan Vegetable Stew Fill 1 Created with Sketch. We're using a special blend of Moroccan spices to make this simmered stew and authentic, warming, comfort food. 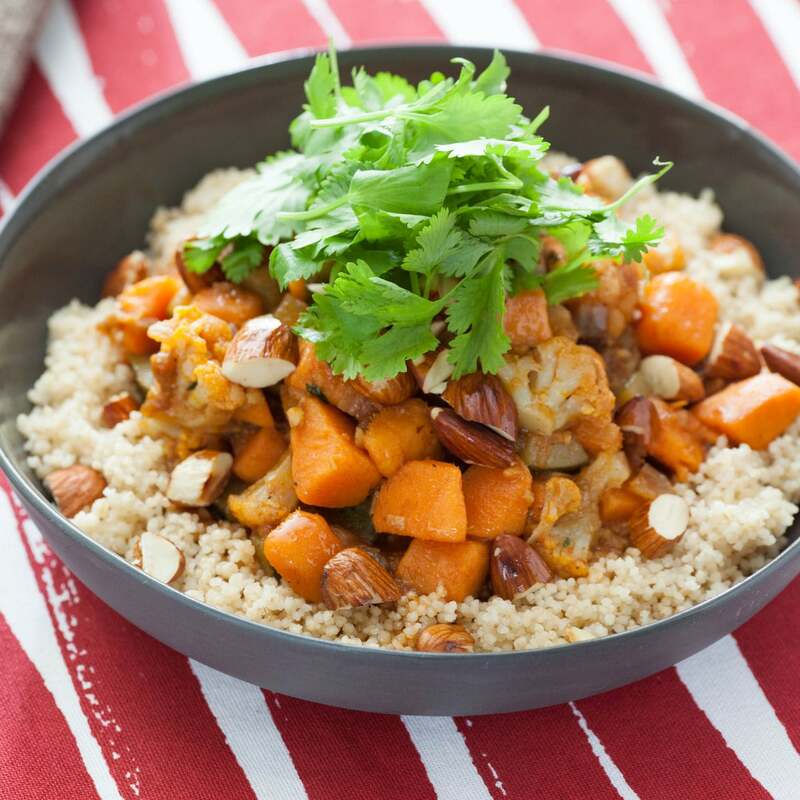 This blend, combined with almonds, dried fruit, honey and hearty whole wheat couscous, creates a well-balanced, exotic-tasting dish that will fill your kitchen with the aroma of coriander, cumin, turmeric and allspice. Wash and dry the fresh produce. Peel and mince the garlic. 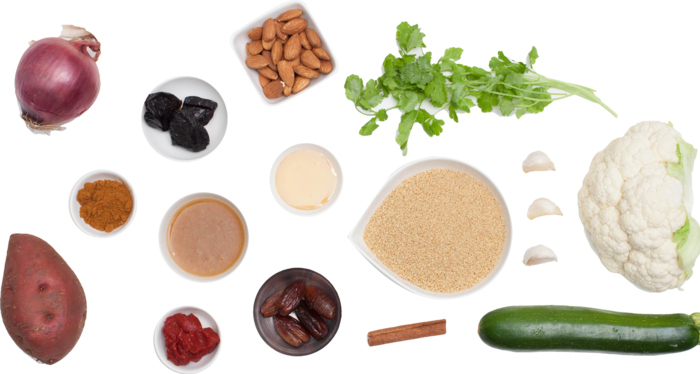 Roughly chop the dates, prunes and almonds. Peel and small dice the red onion. Peel and cut the sweet potato into bite-sized pieces and place in a bowl of cold water. Cut out and discard the thick stem of the cauliflower, then cut the head into small florets. Small dice the zucchini. Roughly chop the cilantro. In a small pot, heat 1 cup of water and a big pinch of salt to boiling on high. Once the water is boiling, stir in the couscous and turn off the heat. Cover and let stand 5 to 7 minutes, or until all of the water is absorbed. 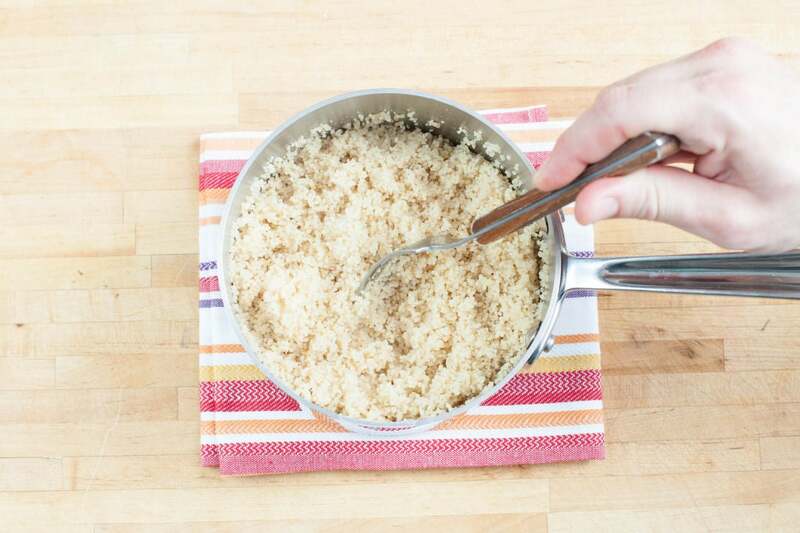 Fluff the finished couscous with a fork. While the couscous is cooking, toast the nuts. 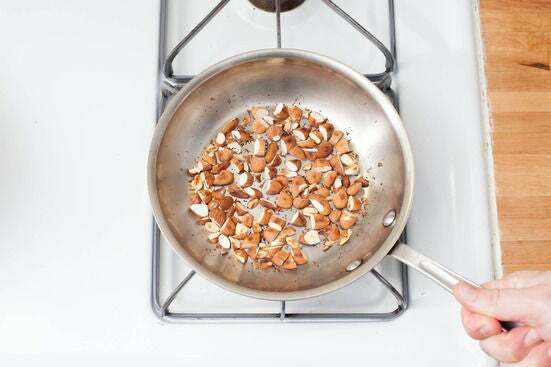 Add the chopped almonds to a dry pan. Heat the pan on medium-high for 1 to 3 minutes, or until the almonds are fragrant, stirring occasionally. Transfer the toasted almonds to a small bowl. In a large pot, heat 2 teaspoons of olive oil on medium until hot. 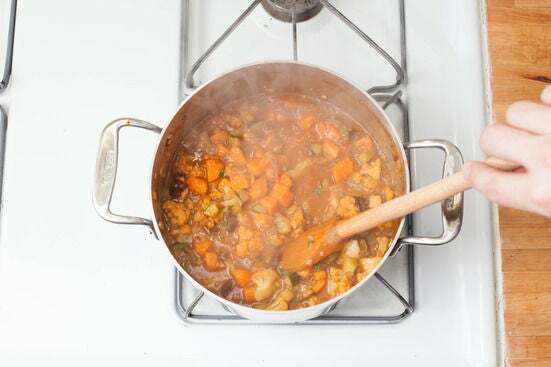 Add the garlic, onion and sweet potato and cook 4 to 6 minutes, stirring occasionally, or until the sweet potato starts to soften. 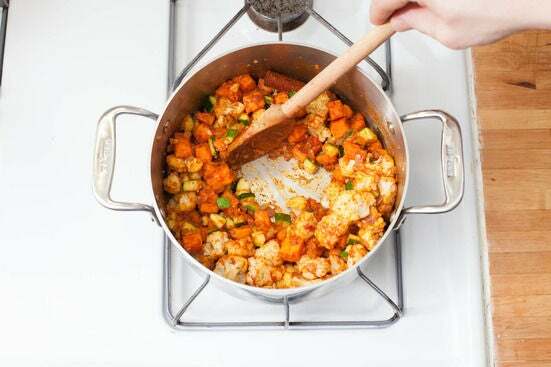 Add the cauliflower and zucchini. 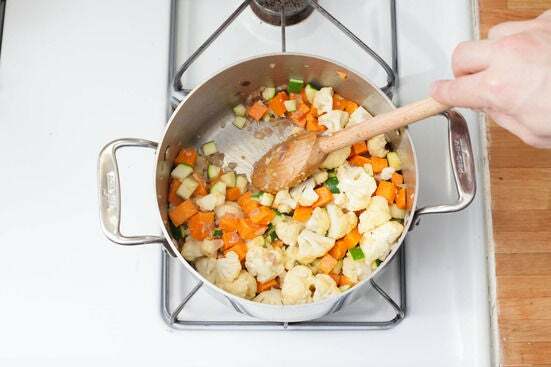 Cook 4 to 6 minutes, or until the cauliflower starts to soften; season with salt and pepper to taste. Stir in the tomato paste, ras el hanout and cinnamon stick. Cook 1 to 2 minutes, or until toasted and fragrant, stirring frequently. Stir in the honey, vegetable demi-glace, dates, prunes and 1 ½ cups of water. Bring the mixture to a boil, then reduce the heat to medium-low. Simmer for 6 to 8 minutes, or until slightly thickened. Turn off the heat, and stir half of the cilantro into the stew. To plate your dish, divide the couscous and the stew between 2 bowls, discarding the cinnamon stick. 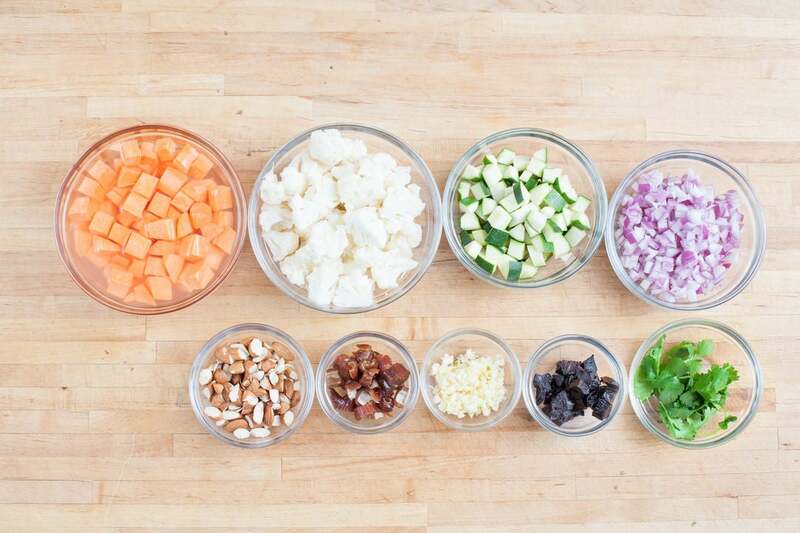 Garnish each with the chopped almonds and remaining cilantro. Enjoy!